I am a South African Artist living in Stellenbosch. My art gallery in Stellenbosch is located in Church Street – a vibrant, culture filled street with many local attractions. 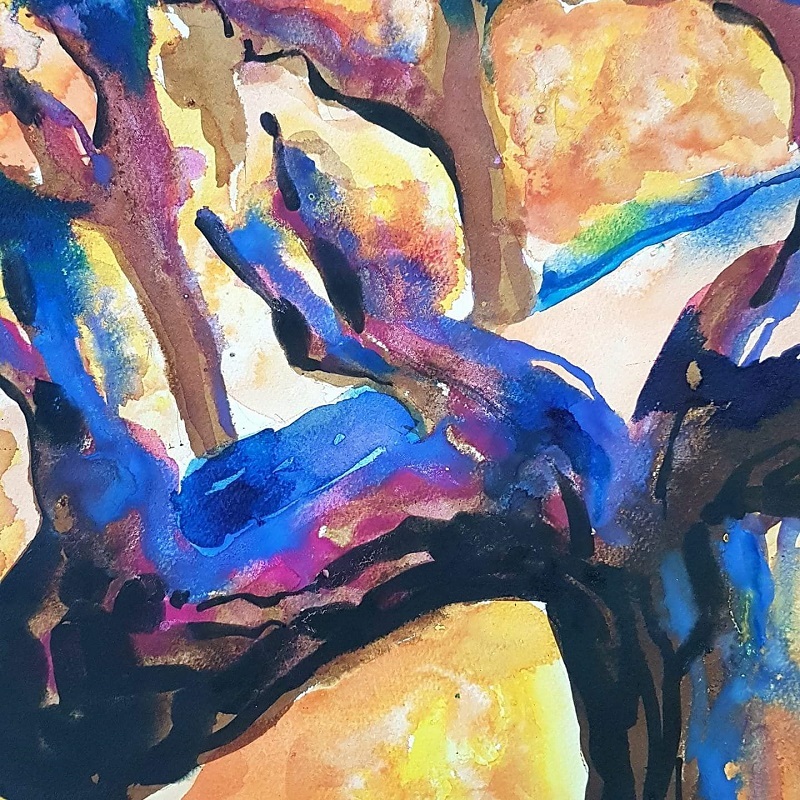 Living in South Africa, I have always been stirred by the local flora and fauna, and I often find myself dreaming of different ideas to paint. My inspiration comes from all over and I’m very grateful for the beauty that surrounds me. I believe art should be shared and the stories behind each piece told. 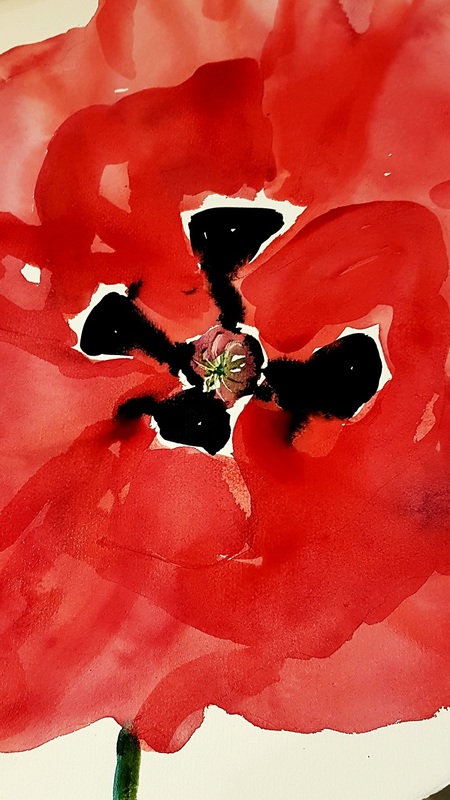 Every artist and their artwork have background stories, but not all have the space to express them – I am fortunate to have a blog where I can share my inspiration, pantings for sale and different aspects of my creative side. This blog is all about inspiration. Each painting is for sale and can be couriered to you or collected from my gallery in Stellenbosch. My watercolour painting of Table Mountain was inspired by the pure magnificence of mountains. Their strength and stature, together with their history inspire me not only in my painting, but also in my day to day life. Inner strength is an important part of life and must be looked after and developed on a daily basis. This painting was inspired by the circle of life. While mountains stand the test of time, the plants and animals that inhabit them do not. Plants grow old and die, and are then replaced with new blooms that spring naturally. Likewise, animals grow old and pass on and their bodies return to the earth. The sunbird is a touch of joy to our landscape and the surroundings of the Cape. We often miss out on the smaller, most joyful things in life, forgetting to pay attention to detail in our daily lives. This painting made me think of and appreciate my existence on earth. 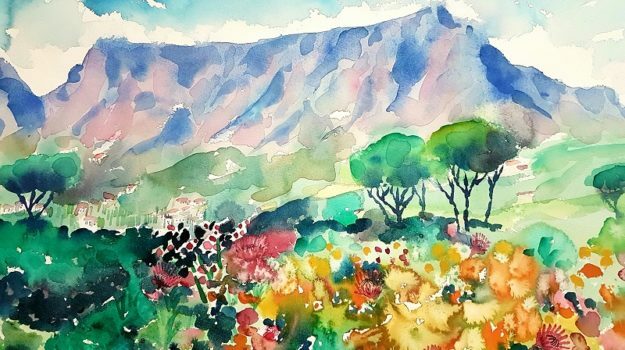 Living in the Cape we are blessed with some of the most exquisite views and vibrancy, and I always try to bring fynbos and our local flowers into my landscapes. 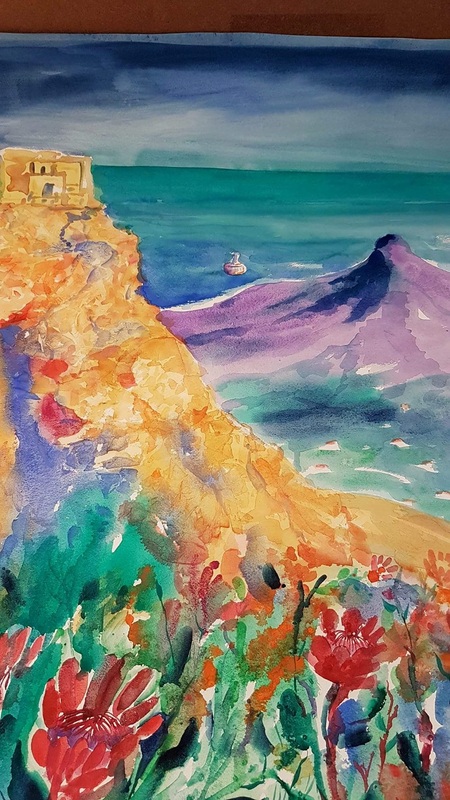 This painting was inspired by the glow of Lions Head and a view of it from Table Mountain. It was painted with paint and a brush purchased in Venice during my recent trip to Italy. The paint made in Venice is every artist’s dream and I was thrilled to have had the privilege to purchase some myself. Abstract has always excited me. With no boundaries and complete freedom I feel a new sense of creativity. Georgia O’Keeffe’s work is a great muse for me and I am very grateful for the role her paintings have played in my own work. How can one not be awed by the majesty of the King Protea. This flower and the colours it produces leave me breathless. 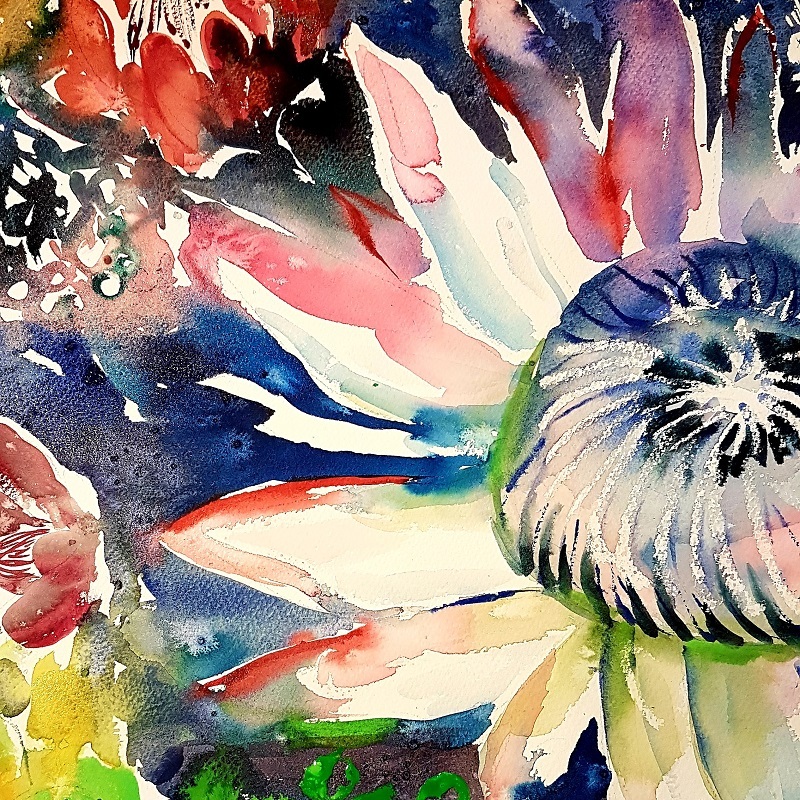 I love to use watercolour to play with the subtle colours of the flower. 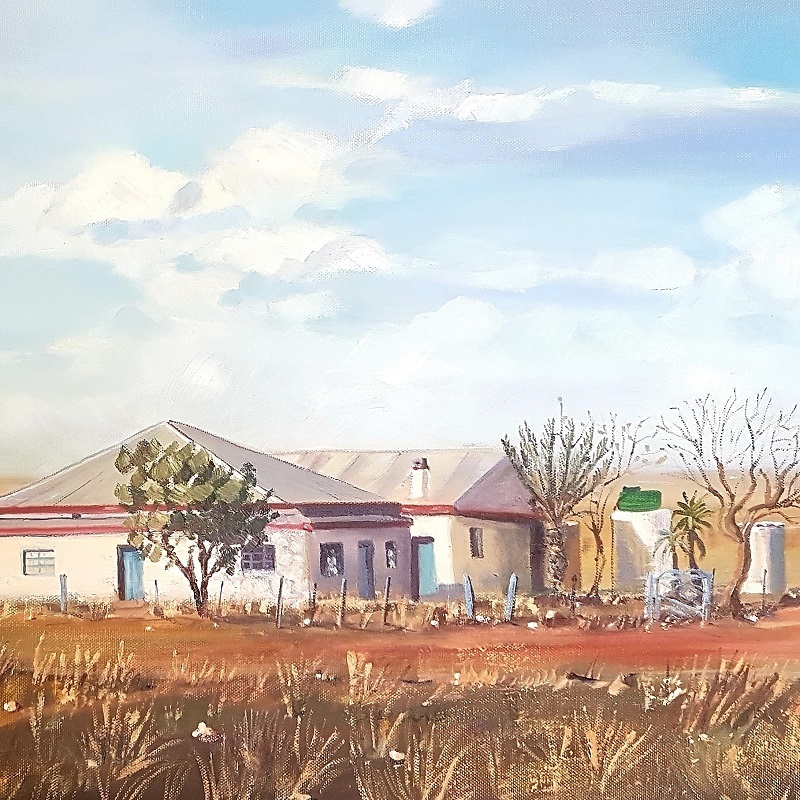 In this painting I brought in local Fynbos to enhance the composition. We must always remember that even the most subtle are bold. Another abstract favourite of mine. Living in Stellenbosch, I am surrounded by vineyards. This painting was inspired by the specific time when vines must be pruned in order for them to flourish – a fact not appreciated or known by many. For this painting, I wanted to take something ordinary and make it extraordinary. A vast arid landscape that stretches over 440 000 square kilometres. A place where life and death meet and dance together. Hot summers, scarce rainfall and cold winters mean life in Namaqualand is challenging, however, in Spring this region transforms into paradise – a wonderland filled with flowers and their vibrant colours. A truly magnificent sight to see. 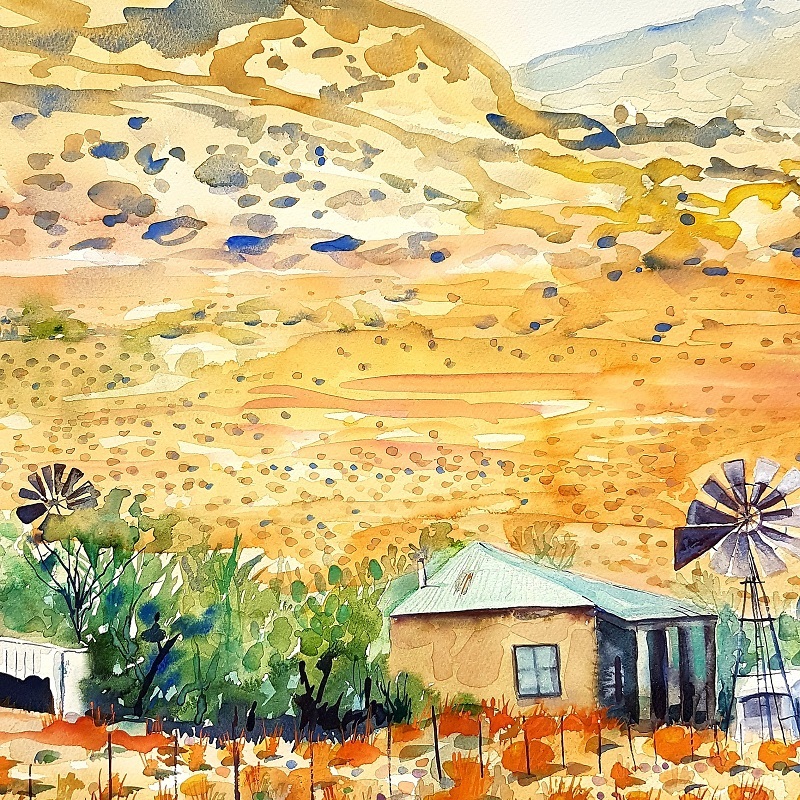 Namaqualand is a real life lesson that we should all take note of – even in the harshest of circumstances – one can still blossom and flourish. This house and it’s beautiful old windmills caught my eye. I love old farmhouses. Last but not least – this is one of my oil paintings for sale. I loved the setting of this old farm house painted with blue doors and window frames, and its matching gates and poles around the house. This house and its tranquil setting can be found near Calvinia in the Great Karoo. I thank you for taking the time to read the stories of my art and what inspired me to paint them. 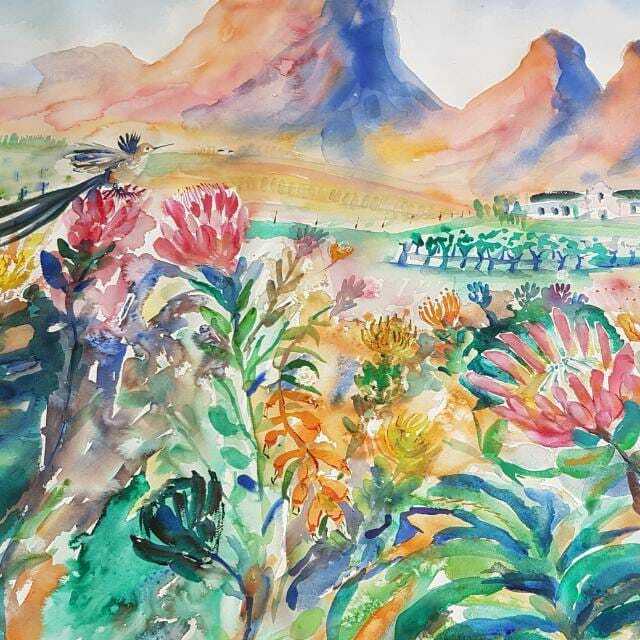 Each artwork mentioned here are paintings for sale in Cape Town & Stellenbosch, however I am happy to courier my artwork all over the world and have many happy clients worldwide. For more information about my paintings and pricing, please contact us.